Today i am going to give you the review about BearMoo Hair Straightening brush manual. Most of the people like their hair to be straight on every occasion. I, myself, prefer to straight my hair for all events. But excessive straightening damages the hair. In order to avoid the damage, I used many hair straightening products but I instantly fell in love with BearMoo Hair Straightening Brush because of its excellent result. My hairs were shinning naturally and I was really impressed by the long lasting result of BearMoo Hair Straightening brush. Here I am going to tell you about the amazing features that make me fall in love with this product; also I am going to share the negative effects, positive effects and the overall quality of BearMoo Hair Straightener Brush. 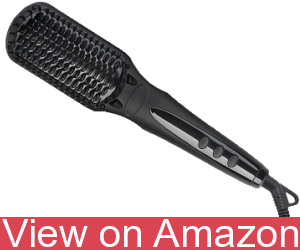 Color Tip: BearMoo Hair Straightening Brush just comes in Black color. In my opinion black is a very attractive color so I went for it! Let’s discuss the above mentioned and other amazing features in detail! The full black body of this brush gives it a very attractive look. It is very easy to use and covers most of your hairs in one turn, giving a very classy look. It not only straights your hair but also gives natural shine, reduces the knots, frizz and split ends. After using it, my hairs were looking even smoother and healthier. BearMoo straightening brush is made up of plastic material so there are very less chances of any burning. Another incredible feature is that its straightening plates are made up of ceramic, which gave my hair very natural, smooth and classy look. Black is the only color in which this product is available and it is quite attractive to me. Because of its smaller size, it is easy to keep BearMoo Hair Straightener as your travelling partner. Another feature that makes it more elegant and classy is its rounded end, which is not common in other hair straighteners. The dimensions available for hairs are 1.8X1.6X2.4 inches. This makes it more easy to use. The overall weight is 14.1 ounces. The length of the cable is longer than other straighteners and is tangle-free. In the end, a very nice drawstring pouch and a stylish black box comes with it as a gift from BearMoo. This makes it perfect to carry with you. The best property that attracts me about this product is it multiple range temperature adjusting technology. As its LCD comes with multiple buttons, it is very easy to adjust the desired temperature. The temperature reaches to maximum in less than one minute. The MCH technology keeps your hair from any damage by giving extra shine and smoothness to your hair. Another property is that it has a hanging-hook in its cord, which is used to hand the straightener after use. The anti-scaled design makes it more unique and easy to use. The bristles cover up most of the hair from top to bottom without wasting any time. The plug in it is compatible for European electrical outlet as this brush was basically designed for European markets. A simple adapter is needed to plug it into American outlet. The buttons like on/off, temperature up and temperature down, makes it very easy to use. The Anti-Scald Design makes it safe for use from the scalp. The bristles are made up of plastic nd it do not cause any harm to the roots. The double anionic spray makes it more reliable and easy to use. Moreover, BearMoo Hair Straightening Brush also comes with detailed manual in it. This manual contains detailed featured notes about all of the features of this product, which is very helpful. My hairs are naturally curly, and I was so sad that even after using so many products. I was unable to find such a perfect hair straightener that gives my hair a long lasting classy and smooth hair style. After using BearMoo Hair Straightening Brush, I was so much impressed by the result that I never needed to try any other Hair Straightener. 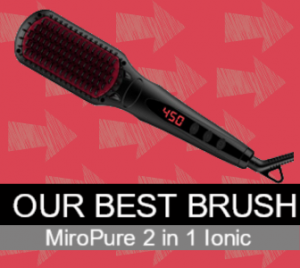 This brush is unbelievably fast and comfortable to use. Also, because of its small size, I can take it anywhere with me. This is the most reliable, handy and easy to use Hair Straightener. It has many unique features which are not common in other Hair Straighteners. The maximum temperature reaching time is amazing and also the LCD display. The small size and gift box for packing makes it more recommended. Also the first impression of its sleek and classy black design makes it more attractive. The long and tangle-free cord makes it damage free. The American Metal Ceramic Heating makes your hair sleek, smooth and frizz free in very less time. The built-in ionizer gives your hair more healthier and long-lasting look. And above all, all these features come in a budget free cost of between $40-$50. A product that has rarely any drawback and is suitable for all types of hair, comes in this price with free shipment is and incredible deal.